It’s all happening. The rice season is in full swing now. 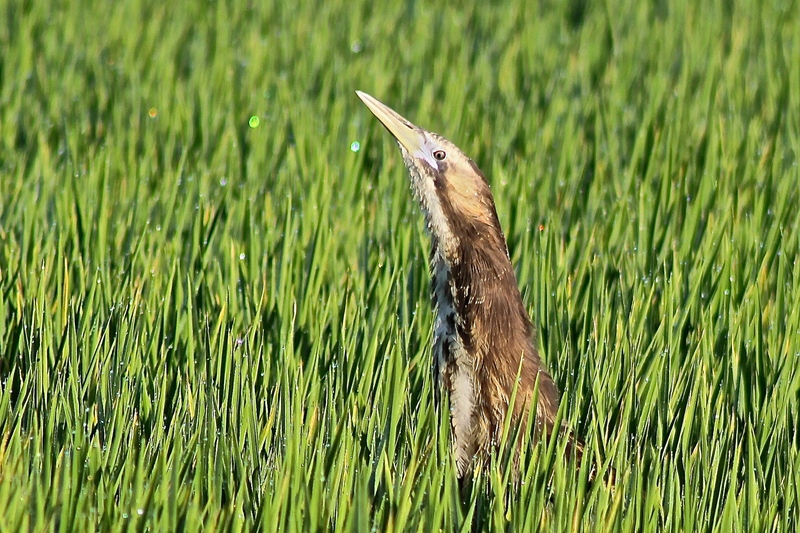 We’ve had bittern sightings across the Finley, Deniliquin, Wakool, Coleambally, Darlington Point, Leeton, Murrami, Griffith and Barren Box regions. The sound of Bunyips fill the air as the new year approaches. There’s an abundance of prey, like tadpoles and carp, and it’s only a matter of days or weeks before we confirm the first nests for the season. But, as always, it’s a race against time. We want to gather as much useful information as we can before the males cease booming and the rice height makes surveys inefficient. 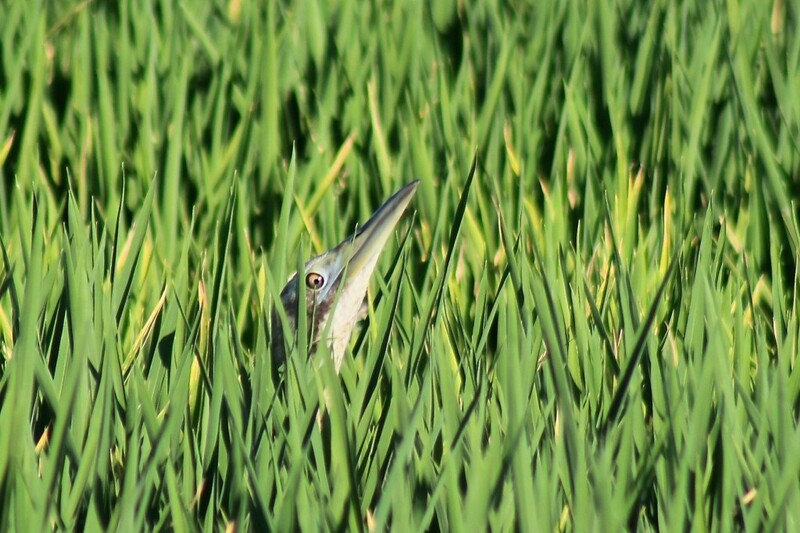 This bittern was reportedly winking at passers-by last week. Sunrise and sunset are the best times to hear and see bitterns. Low storage levels meant that allocations were poor in the lead up to the season, especially in the Murray Valley. 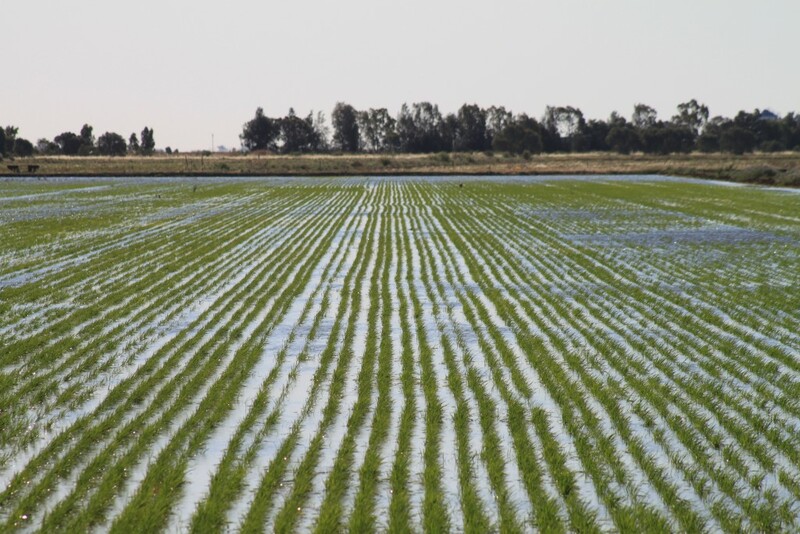 The overall NSW Riverina rice crop looks like it will be 20 000-25 000 hectares, about a third of last season’s 67 862 hectares, and it’s a long way off our first season (2012/13 – 113 500 hectares) when we had 100% allocations following record wet years. Breeding bitterns are quite territorial, so stiff competition and a large surplus of ‘rice’ bitterns is a likely result of these dry times and the smaller crop. Significant and locally unprecedented numbers of bitterns have been recorded at key wetlands in the broader region. For example, up to 34 were counted during November by Keith Hutton, Max O’Sullivan and others at Fivebough Swamp near Leeton, while recent surveys led by Adrian Martins and the North Central CMA at Johnson’s Swamp near Kerang cemented its place, together with the adjacent Hird Swamp, in the upper echelons of importance to Australasian Bitterns. 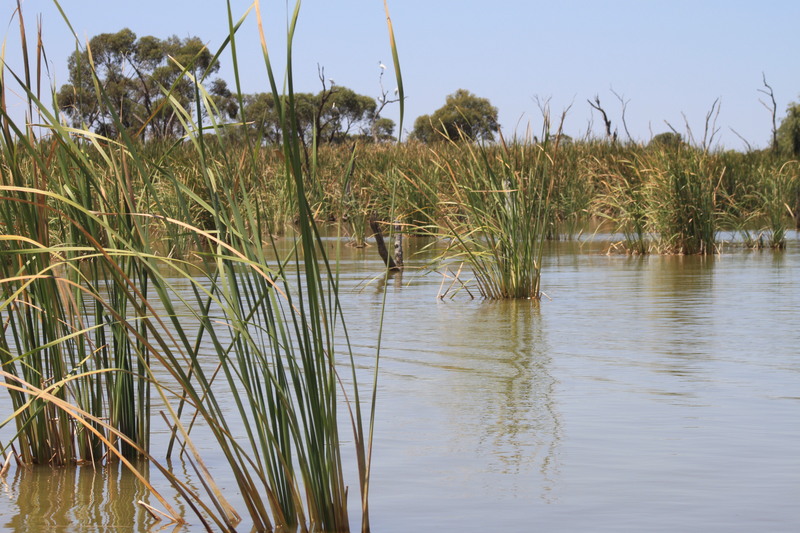 Together with the Riverina’s rice fields and a handful of other sites, like Bool Lagoon in SA, they are the cornerstones of bittern conservation in Australia. After a month-long stay on the Crawford River near Hotspur in south-western Victoria, our beloved Robbie decided it was time to move again. He headed west on December 3rd and discovered a small wetland that’s embedded in a pine plantation near Dartmoor. It was only a brief stop and before long he was back in the familiar surrounds of Pick Swamp in South Australia. 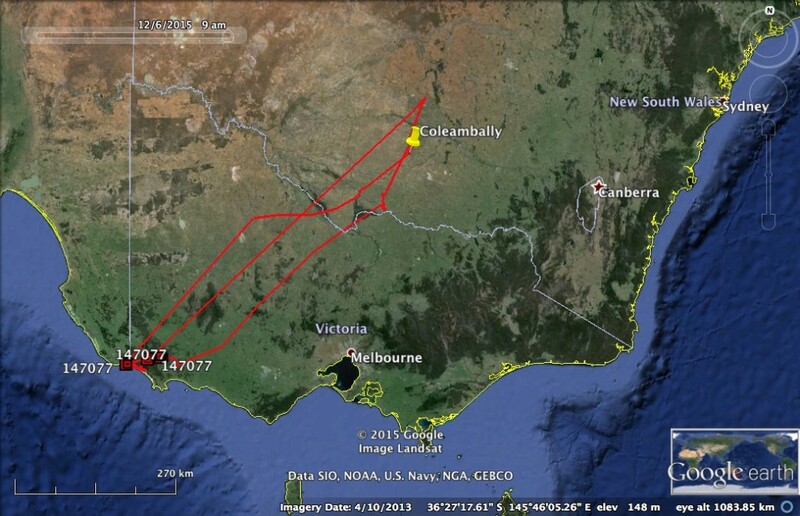 This is where he first arrived after his initial 557 kilometre dispersal from Coleambally seven months ago. And it now looks like he’s retracing his journey. Three days ago, he crossed back into Victoria, settling around the mouth of the Glenelg River near Nelson, just as he did seven months ago. It’s his seventh state border crossing (NSW-VIC-SA-VIC-NSW-VIC-SA-VIC), and it’s a fair bet that he’s on his way back to Long Swamp. But then where? 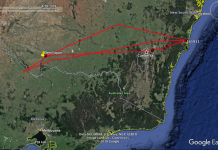 Another return to the Riverina? Maybe he just likes doing laps of his inland-coastal route. It’s like he’s in training for the Bittern Olympics! Robbie returns to Pick Swamp, part of South Australia’s Piccaninnie Ponds Karst Wetlands Ramsar Site. 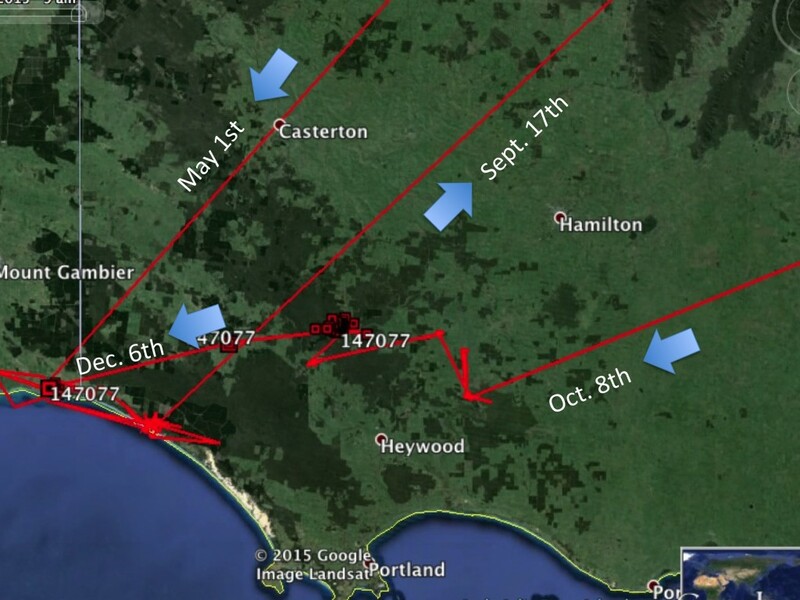 The movements of Robbie since his satellite transmitter was attached on April 21st, 2015. With great excitement and anticipation, we’re readying ourselves to capture five more bitterns this season and attach satellite transmitters. 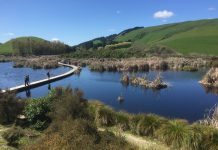 Thanks to the help of the NZ bittern crew (Emma Williams, John Cheyne & Colin O’Donnell), we’ve constructed customised cage traps with mirrors, adapted from a design used for American Bitterns. Using call playback, we hope to lure territorial males and attach the three transmitters we have in hand. All going well, we’ll then order another two. After that, the plan is to save the final four transmitters for the 2016-17 season. With the thrill and insight that Robbie has brought us, it’s hard to imagine what a total of another nine bitterns will reveal. All of this is thanks to the generous support of so many people and organisations that contributed to our crowdfunding campaign last year. 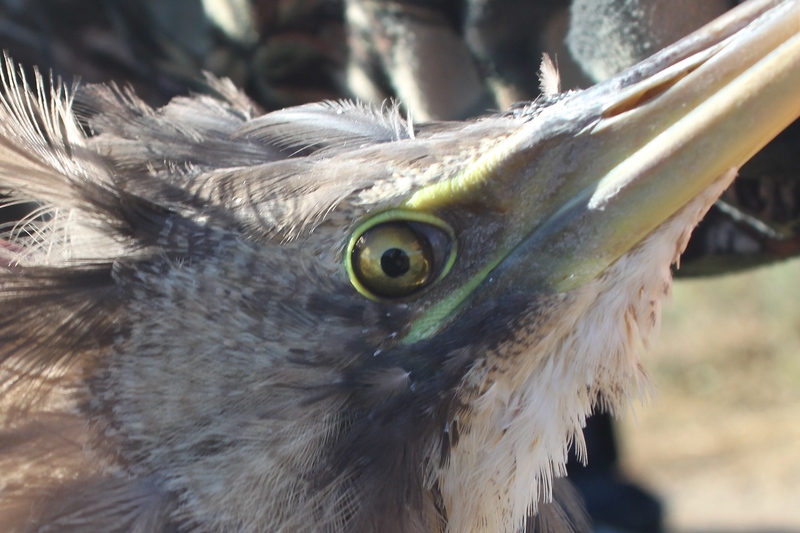 Thanks to funding from Riverina Local Land Services, our new study on bittern prey and sowing methods has begun. 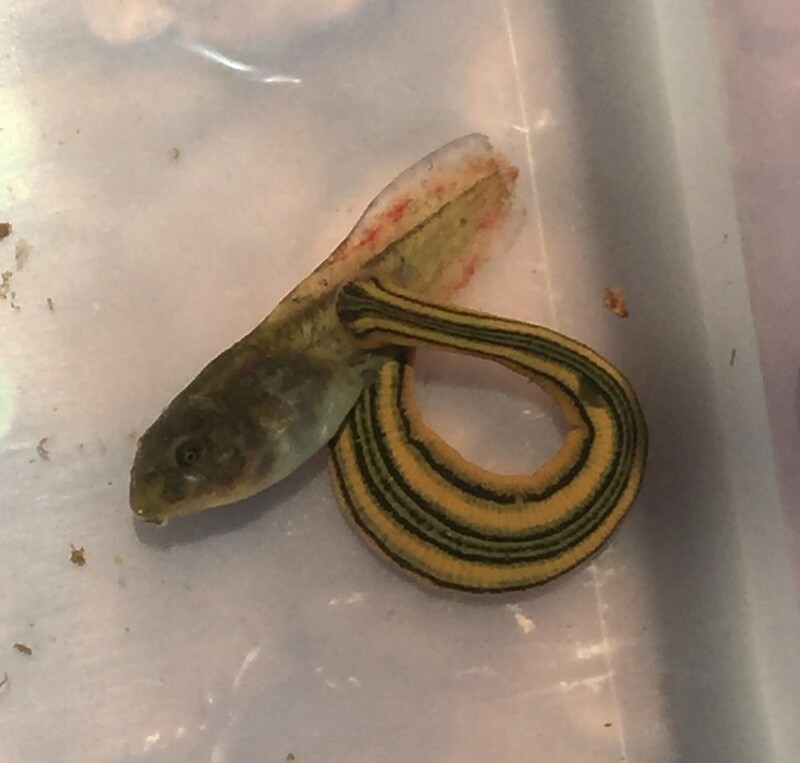 On top of our long-term population monitoring and breeding studies, which involve the use of randomly selected rice farms, we can now home in on what’s happening below the water’s surface. 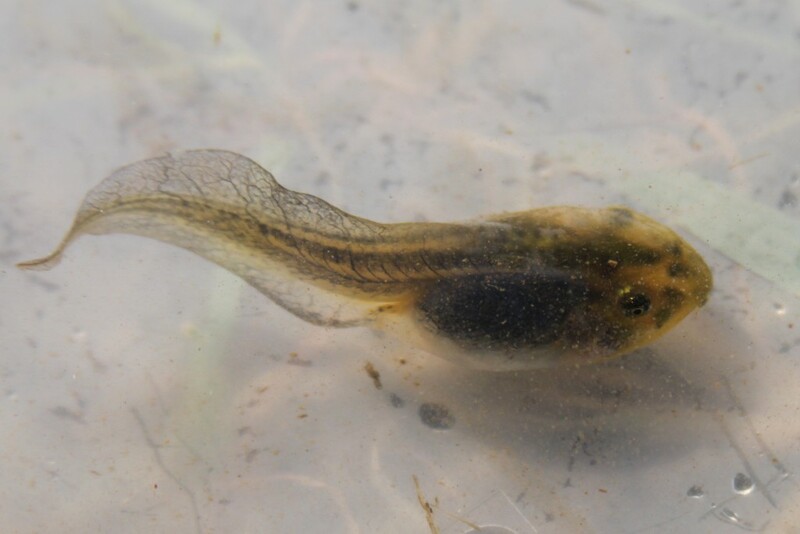 The results from our paired sites so far suggest that, as predicted, crops with sowing methods that involve earlier permanent water, like aerial and dry broadcast, have substantially more frogs, tadpoles, carp and other bittern prey, compared to crops that were sown with methods involving dry phases and delayed permanent water, like direct-drill, combine-sown and sod-sown. It helps explain the sowing method preferences that bitterns have shown since our project began in 2012. 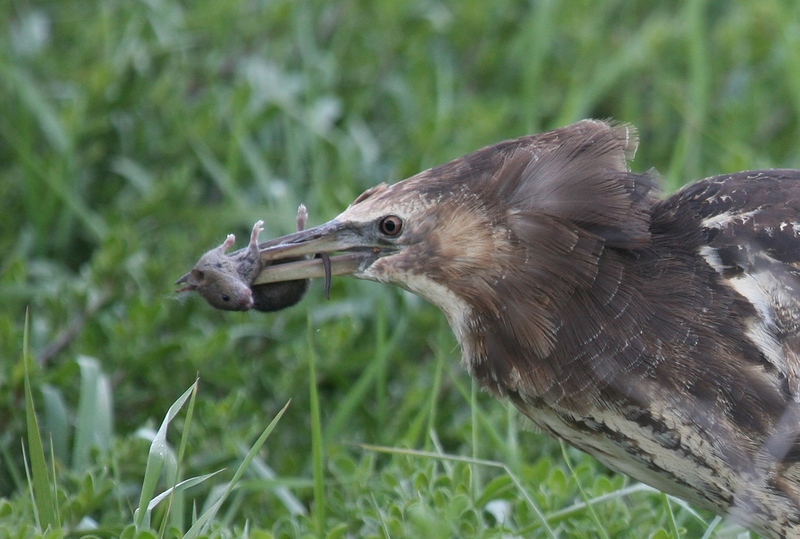 The abundance of prey in the aerially/broadcast-sown crops that are supporting bitterns is impressive. Stay tuned as the data rolls in. 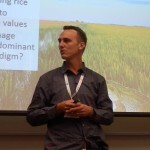 Rice crops that are ‘direct-drilled’, ‘combine-sown’ or ‘sod-sown’ receive delayed permanent water. 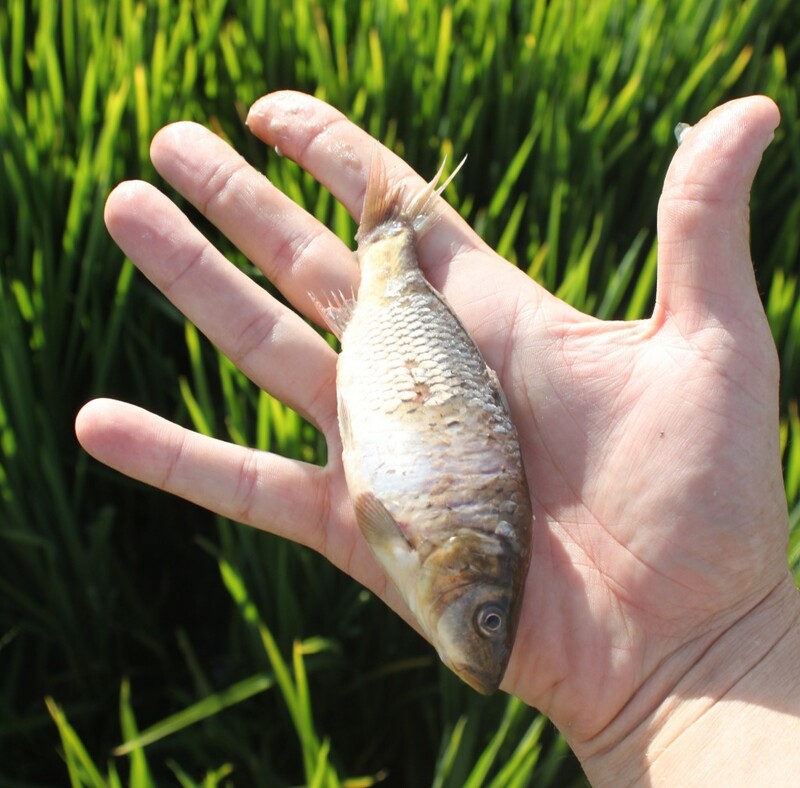 Carp have entered this Murrami rice field at ~2.5 cm. Last season, by March, they were ~16 cm and it was a waterbird feeding frenzy (see below). 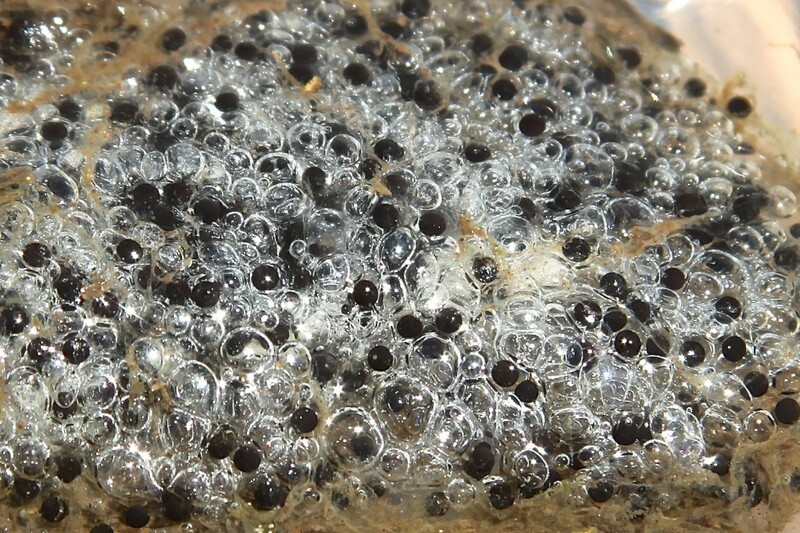 Southern Bell (Growling Grass) Frog tadpoles, up to 100 mm in length, are probably important bittern prey. 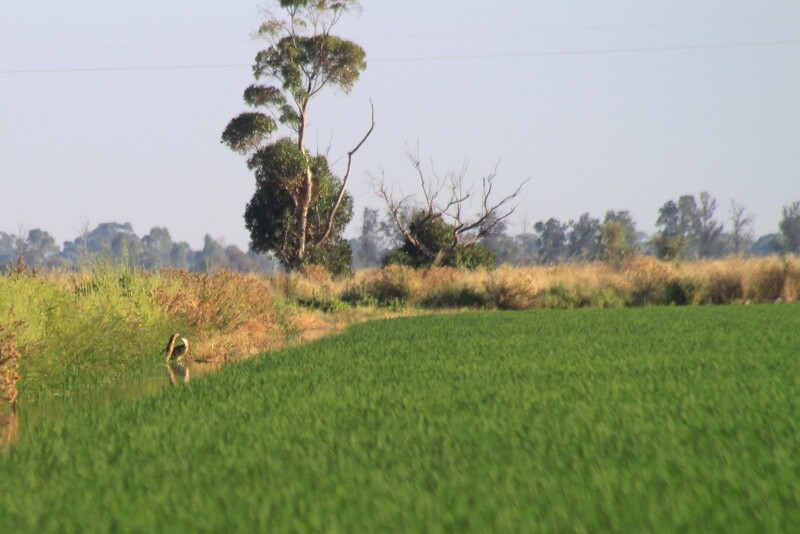 Spotted Marsh and Barking Marsh Frogs breed in huge numbers throughout the Riverina’s rice fields. 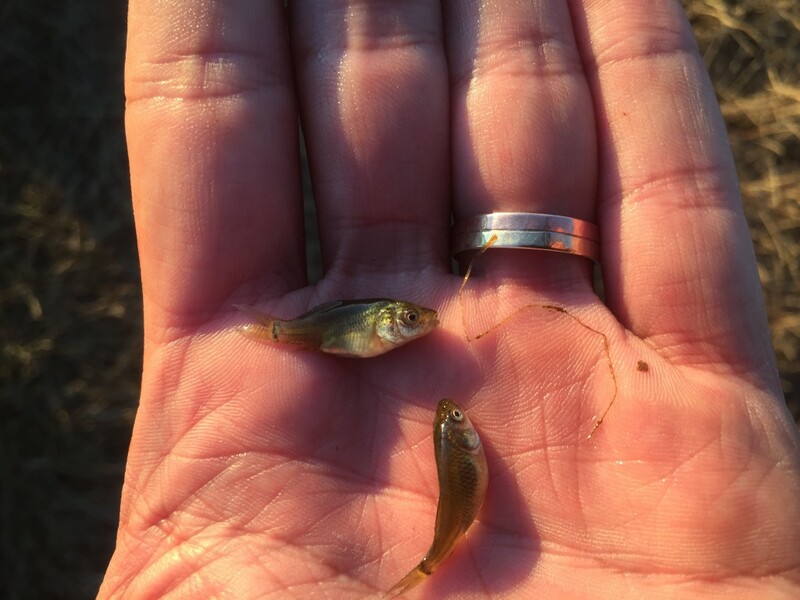 If the waterbirds don’t get ’em, the leeches might. But fear not, there are billions to go around. With their bond established, the lease secured and abundant prey, it’s time for family planning. Matt, this is fascinating stuff and the crop figures you quote lead me to wonder why irrigation farmers are being forced to give up most of their water entitlements so that swamps which have been largely abandoned by wildlife (in favour of artificial wetlands) can be flooded and, according to July/August Australian Geographic, red gum saplings can be deliberately drowned. I kid you not. Check the photo caption on page 83. Thanks David. I appreciate your concerns. It’s a tricky situation but unnecessarily polarised. All involved are still grappling with this new era. I think all major water users can be more strategic and integrated in their management. We all have much to learn about how best to get the most out of every drop. As far as I know, nobody has been forced to give up their water, rather it was their decision to sell on the market. Most of the final environmental water recovery is now set to come from infrastructure improvements that lead to water savings. I’ll check out the last Aust Geo. Thanks again. This is great work Matt. 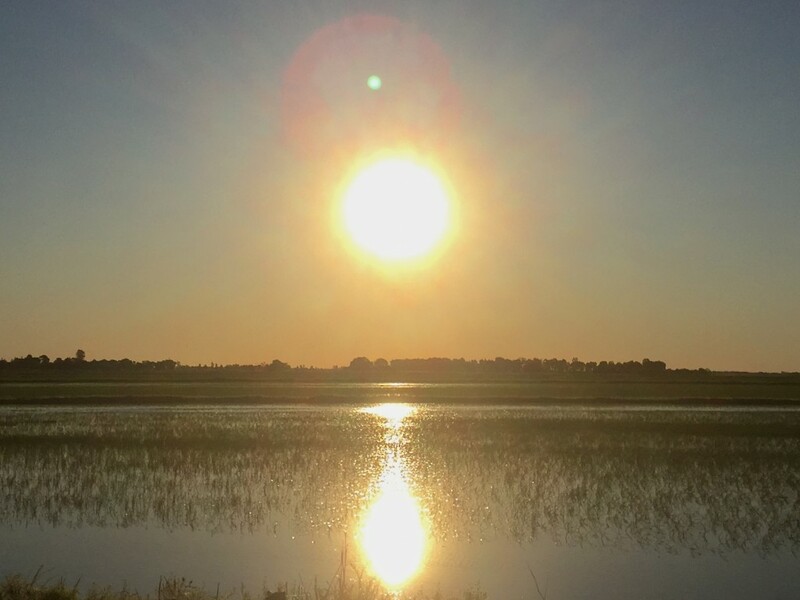 There will be growing economic pressure on rice growers to increase their water use efficiency with inevitable reductions in water availability and rising costs. It may be that acase could be made for supplying farmers with environmental water to enable early flooding to support bitterns. Thanks Judy. I think you’re spot on. Supplemental e-water, incentives, other means, and perhaps even a new allocation for integrated use, are certainly avenues we’re pursuing.